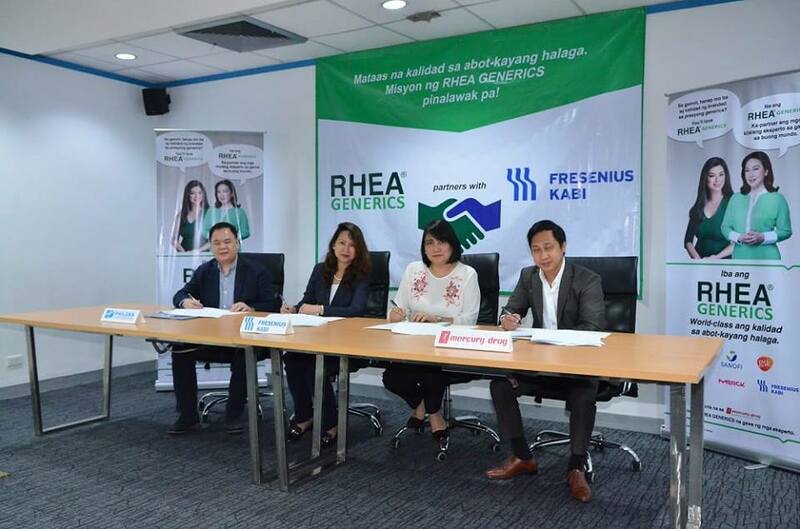 RHEA Generics, a front runner of world-class and affordable medicines in the country, recently formalized its partnership with global healthcare company Fresenius Kabi, which will launch a new generic medicine addressing chronic kidney disease in the Philippines. According to the National Kidney and Transplant Institute, over 10,800 Filipinos are affected by chronic kidney disease, with tens of thousands of patients needing to undergo dialysis annually. Philusa Corporation President and General Manager Neogin Evangelista expressed, “Our latest collaboration with Fresenius Kabi affirms our ceaseless pledge in delivering excellent quality medicines catering to a diverse set of medical concerns that is economically, and conveniently accessible to our fellow Filipinos. RHEA Generics will continue to work hand in hand with leading global pharmaceutical companies to ensure we are able to deliver our promise of offering generic medicines having the same quality, efficacy and safety of the innovator brands.” The new RHEA Generics drug, which will be exclusively available in all Mercury Drug stores nationwide starting November, in combination with a protein-restricted diet is an excellent drug that preserves the residual function of the kidneys of patients with Chronic Kidney Disease and delays its progression to dialysis.